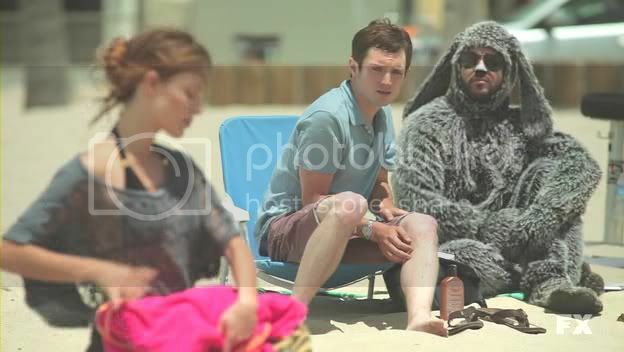 “Sacrifice” wasn't much funnier than last week's installment of Wilfred, but it was still an improvement. For the second time in as many episodes, Ryan was contemplating freeing himself from the unhealthy relationship he shares with Wilfred, but the crazed canine was having none of that. “Sacrifice” just wasn't that entertaining, though it was less from the jokes that fell flat and more because of a general lack of trying. In fact, this episode had the emotional scenes one would normally associate with a season finale, as opposed to its lead in. Ryan's escape plan came in a much prettier package this week(sorry Dwight Yoakam), and even spoke Italian. Cinzia, the Mediterranean beauty that Ryan meets on the beach, was a too good to be true type of girl, certainly from where Ryan was sitting. Of course before any talk about leaving the country could come up, the two had to get to know each other. Unsurprisingly, Wilfred gives them about two minutes to do so before he sets to ruining their budding romance. His appearance did earn the first laugh of the episode(besides Ryan's deer-in-the-headlights stare as he moons over Cinzia, and Elijah Wood's glaringly white legs), so he can be forgiven for being such a poor wingman. Comparing the sacrifice Ryan has to make in picking up Jenna's dry cleaning to the sacrifice the Roman soldiers made in killing Jesus brought an outburst of laughter, made even better by Wilfred's convincing sympathy for those poor centurions. Being the weak-willed runt that he is, Ryan of course kowtows to Wilfred's whining and passes on a date with someone who could be Italy's entrant in the Miss Universe Pageant. Granted, the pair's stopoff at the marijuana dispensary was certainly more entertaining than rollerblading would have been. Without ever saying a word, Bear has become one of the funniest characters on the show, second only to his mutt of a mate. Wilfred contacting him on his wrist mic to acquire a “twenty” on Jenna was the kind of silly humor that doesn't always work, but kills a scene when it does. It will be hard not to think of Bear as “Agent Grizzly” from now on though. The bit was actually even funnier the second time around when Wilfred took pleasure in keeping Bear's Walkman from him. The episode started cooling down soon after though, when Ryan finally becomes fed up with serving as Jenna's personal assistant and goes looking for Cinzia. They're date was necessary for their to be any believability in their whirlwind romance, but that didn't save it from sitting flat on the screen as far as comedy goes. The laughs weren't flowing any more freely once they ended up in Ryan's bedroom either. Wilfred staying to watch them was one of the few outright bad jokes of the episode and came off as overly-creepy without a comedic punch. This is around the time when Ryan smartly decides that a change of scenery might not be such a bad idea. Jenna letting Ryan know how much she appreciates him was long overdue, but her emotional outpouring was another dry spot. The series just hasn't set itself up to to be anything other than a pure comedy, so moments like that stick out. The same can be said of Ryan's story about his dad. It was an endearing moment for the character, in which you can't help but sympathize for him, but since there hasn't been aspects of a dramedy in the series before now, it felt jarring. Both scenes also made it very noticeable that there were no jokes being made. Wilfred came through in a pinch though, and the priceless image of him in his tourist outfit -after having wormed his way into Ryan's move- helped to shake off the melancholy vibes of the last two scenes. Of course there wouldn't be much of a show left if Ryan actually took off to Italy, so by the end of the episode Wilfred has convinced him to stay. He does so by tapping into Ryan's subconscious and providing us with a bizarre courtroom dream sequence. Wilfred filling the roles of judge, prosecutor, and even stenographer was worth a chuckle, as was Bear serving as Ryan's defense. Hearing how Ryan spent his time as a lawyer -digging up dirt on the opposition- also shed some light on why he has such a hard time being happy. The guilt that drove him out of his profession is still clearly affecting his relationships, and is perhaps the reason behind letting Wilfred fill his life with such misery. “Sacrifice” didn't have many jokes that bombed, but it also didn't have enough jokes to begin with. A few enjoyable moments kept the episode from being the series' worst, and the laughs it did garner made it worth watching. Though considering there is only only one episode left this season, hopefully Wilfred has been saving the best for last.